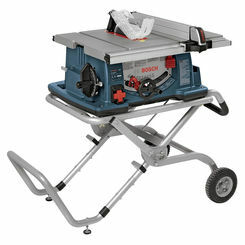 Many power saws are fixed and others are hand-held, but the portable table saw offers the best of both worlds, because you can easily haul it in a truck and roll it around your job site, while it simultaneously offers fixed, standard, and replicable cuts. Ridgid table saws are available at prices so low, we are not allowed by contract to advertise them (which is why you must see price in cart).  For the best power tools online, choose PlumbersStock. 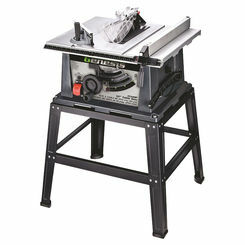 Also known as a sawbench, table saws are great additions to workshops or job sites and perform many functions that make them essential tools for handymen, woodworkers, or construction workers. Table saws can quickly make straight, joint, and groove cuts, as well as miter and bevel cuts, allowing the user to take on many different projects. 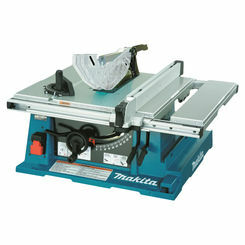 A table saw is a simple machine that uses a circular saw blade geared onto an arbor and run by an electric motor. There are three types of table saws: Portable saws are small and inexpensive, but are best used for smaller cutting jobs. 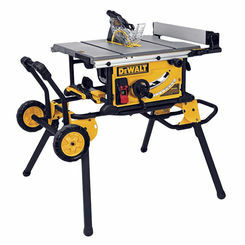 Contractor saws are found in most woodworking shops and can handle large jobs. Cabinet saws provide the most motor power and the largest work surface, making them the most accurate and expensive purchase. 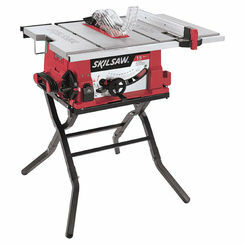 Most table saws come with three standard components, namely the rip fence, miter gauge, and bevel system. The rip fence is a bar that functions as a guide for a workpiece as it moves past the saw blade. The miter gauge is an adjustable guide that can move the workpiece past the blade to make cuts at specific angles. The bevel system is used to allow the user to tilt the blade to make bevel cuts. With so many uses for a table saw, it’s easy to forget safety precautions and guidelines. 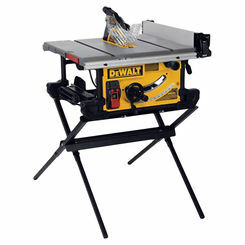 Like most other power tools, there is a right and wrong way to use a table saw. Below are tips to help you make the most out of your tool while staying safe. 1. Install the Blade Guard – Your table saw comes with a blade guard that includes a splitter and anti-kickback pawl. If you initially set this piece aside, now is the time to wipe the dust off and install it. This safety equipment is crucial for safe cutting as the plastic guard keeps your fingers away from the blade and deflects flying debris. Additionally, the splitter keeps the board from pinching the blade and accidentally kicking back at you. This kickback danger is further reduced by the anti-kickback pawl, which uses little teeth to grab the board and prevent it from ramming you if the blade pinches or binds during the cut. 2. Use a Push Stick – Even with a blade guard, it’s a dangerous habit to rest your hand too close to a working blade. Push sticks allow you to keep your hands a safe distance away from the blade while cutting slender pieces of wood. Between a push stick and push shoe, the shoe design gives you a better grip for more control over the wood and less chance of your hand slipping off. You’ll want to make sure your Push device is made of plywood instead of lumber, as lumber may split apart while in use. It’s recommended you use a push device for any board narrower than 6 inches. 3. Use an Outfeed Table – Cutting long boards is tricky since the board hangs off the end of the table, which may tempt you to reach past the spinning blade to catch it. Stands exist that attach to the end of your table and support this “outfeed” wood, or you can make one yourself to the exact height of your table. 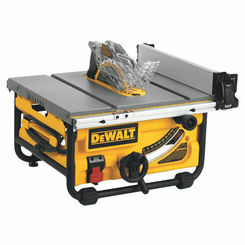 Table saws are fantastic tools to have for a number of different projects, whether at home or on the job site. 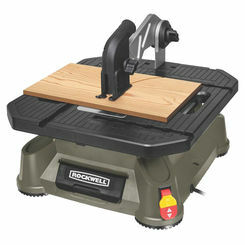 Table saws can be used to cut planks of wood, shape picture frames, and build the perfect deck. 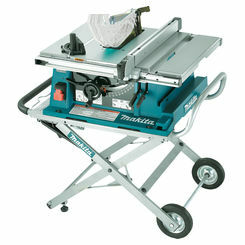 If you’re looking to add a table saw to your list of power tools, there’s no better place to buy than PlumbersStock. We offer the trusted brand Ridgid so you can have peace of mind knowing you’re purchasing top-quality products at a fraction of market price.